(TibetanReview.net, Mar16’16) – There were more than 2,700 recorded industrial strikes and protests in China last year, more than double the number in 2014, and the situation is only getting worse this year, nytimes.com Mar 14 cited China Labor Bulletin, a labor rights group based in Hong Kong, as saying. There were more than 500 protests in January this year alone, the report added. 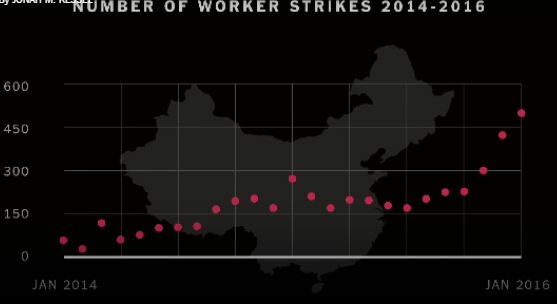 The report noted that as China’s economy slowed after more than two decades of breakneck growth, strikes and labor protests had erupted across the country. Factories, mines and other businesses were withholding wages and benefits while also laying off staff or shutting down altogether. And the workers, worried about their prospects in a gloomy job market, were fighting back with unusual ferocity. The week before, the report noted, hundreds if not thousands of angry employees of the state-owned Longmay Mining Group, the biggest coal company in northeastern China, staged one of the most politically daring protests over unpaid salaries yet, denouncing the provincial governor as he and other senior leaders gathered for the annual national parliament meeting in Beijing. President Xi Jinping, concerned about challenges to the ruling Communist Party, has responded with a methodical crackdown, quashing protests, dismantling labor rights organizations and imprisoning activists, the report said. However, his government has also sought to placate workers, putting pressure on businesses to settle disputes and making billions of dollars available for welfare payments and retraining programs, it added. The dilemma the growing labor unrests poses to the Communist Party is that the latter continues to portray itself as a socialist guardian of worker’s rights even while having embraced capitalism and welcomed tycoons into its ranks, the report noted. 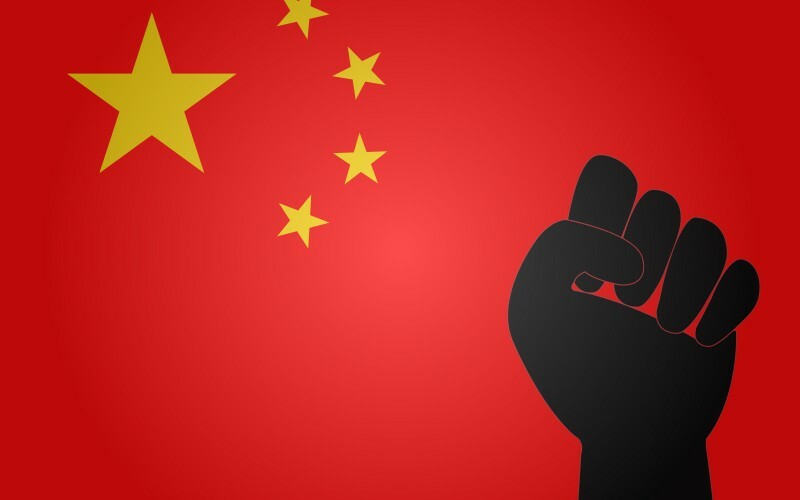 And the situation is only set to worsen as the Chinese government contemplates an enormous downsizing of China’s bloated state industries, which are producing much more steel, cement and other goods than the market needs. The report cited a recent study as saying more than three million workers could lose their jobs in the next two years if the planned job cuts go through. It added that the government had already announced plans to lay off 1.8 million steel and coal workers. The report noted that during the late 1990s and early 2000s, China trimmed the state sector of more than 30 million workers during a wave of privatization and restructuring. However, the economy was booming then, creating millions of jobs in new industries. Although still growing today, it is at its slowest pace in a quarter century, it added. The report said protests had taken place in every part of the country, with the strife most pronounced in the manufacturing and construction industries, which accounted for two-thirds of the demonstrations. In the case of Longmay, miners and others took to the streets complaining of unpaid wages after the provincial governor, while addressing China’s parliament, held up the company as an example of how state firms could be restructured without hurting workers. Longmay had said in Sep 2015 that it planned to lay off 100,000 workers, eliminating about 40 percent of the work force at 42 mines. Despite the rising discontent, however, a national labor movement still remains a far cry. The government prohibits workers from establishing independent labor unions, requiring them to join only the party-controlled All-China Federation of Trade Unions. It has also clamped down on social media, shutting accounts of labor activists, deleting news reports on strikes and monitoring chat forums for signs of collective action. Activists who help to organize workers and campaign for their rights have been detained and subjected to smear campaigns. For example, the report said, in Dec 2015, the authorities arrested Zeng Feiyang, 41, one of China’s most prominent labor organizers, accusing him of “gathering a crowd to disturb social order”. Three other activists were detained as well. Zeng had orchestrated successful campaigns against influential factories and state-owned firms in Guangdong and tutored a generation of labor activists. After his arrest, state news outlets began a smear campaign, accusing him of hiring prostitutes, stealing from workers and conspiring with hostile foreign forces, the report said. Tibet’s GDP forecast kept above ‘new normal’ to continue Chinese influx?